Stealth Cam's Core scouting camera is an ultra-compact camera that is easy to conceal and secure in the woods since it is undersized and equipped with a 4-digit security code system. The 40 IR (infrared) emitters, with a range of 50 feet, provide excellent quality pictures at night or during low light times of the day. 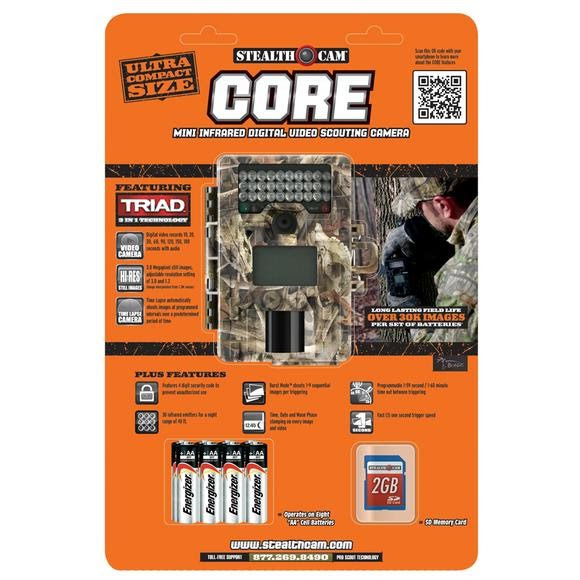 Stealth Cam&apos;s Core scouting camera is an ultra-compact camera that is easy to conceal and secure in the woods since it is undersized and equipped with a 4-digit security code system. The 40 IR (infrared) emitters, with a range of 50 feet, provide excellent quality pictures at night or during low light times of the day. The time/date/moon phase/temperature stamp on video files gives the hunter access to the wildlife habits that they need to know to experience a successful hunt. The COREÕs miniature package is protected in a rugged and durable weather proof 3D digital camo housing for use in all weather conditions.